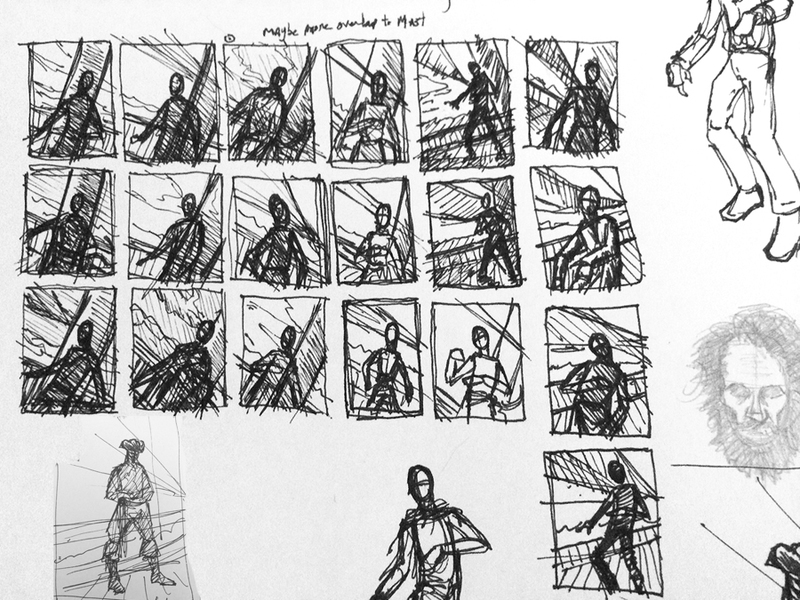 From thumbnail to sketch of final drawing. 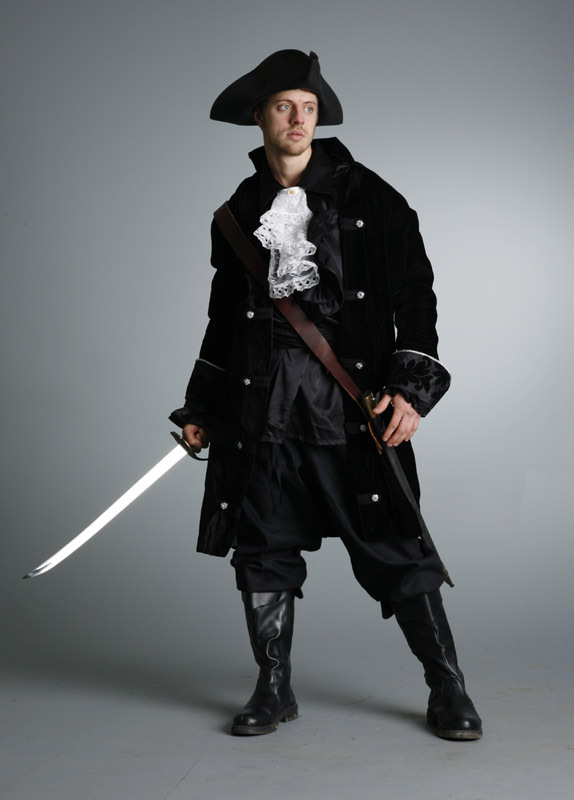 So I’ve been researching images of pirates and ships. I’m looking for believability in the setting and yet I don’t want to get too carried away with details. Since it’s a moonlit piece and the text references the figure falling in and out of shadows I’ll probably have to suppress the level of detail I’ve drawn already. Here are some images I used as reference. Here is the drawing I have for the final. 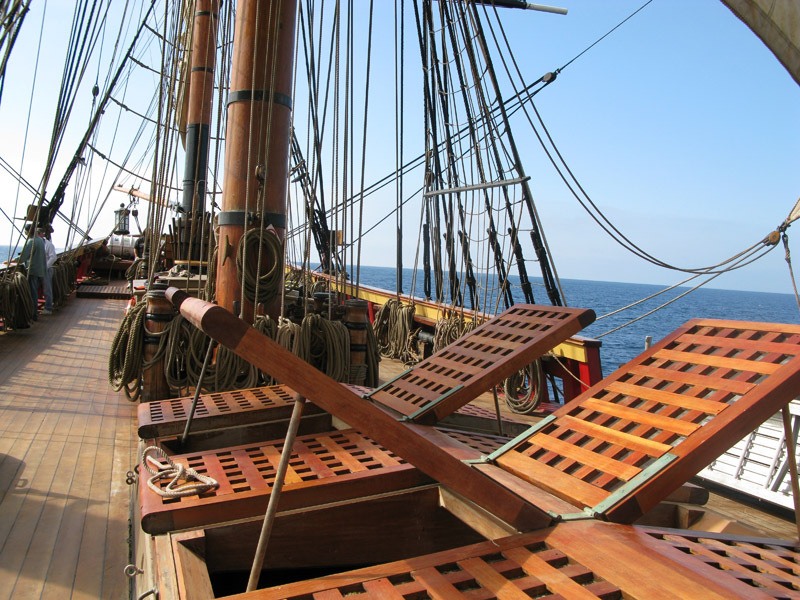 I wanted to have the decking looking plausible with all the rigging and stuff. Some areas of the piece are still loose while others have detail to them. 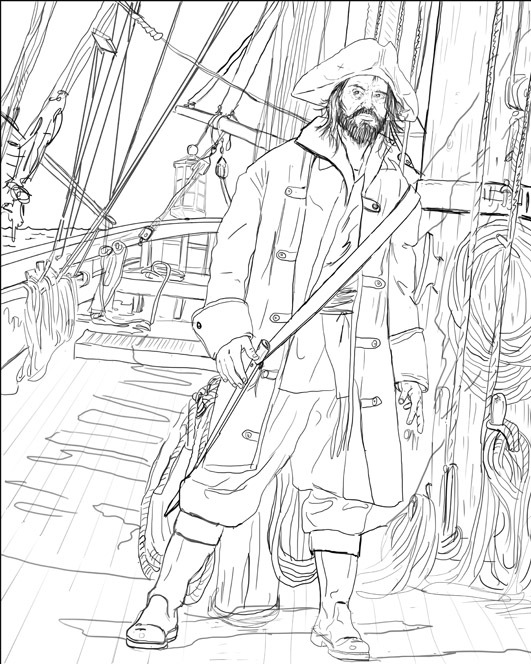 The fun part is the have the lost and found in final piece and adding the ghostly feeling to the pirate. 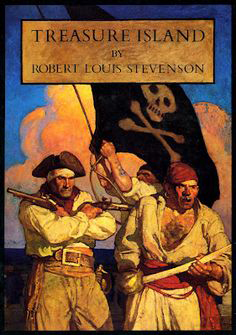 I have a huge respect for the Golden Age of Illustration and many of the top illustrators that I love had done some magnificent Pirate illustrations. So this book was a great chance to take my hand at one, and hope I could do the illustration justice. 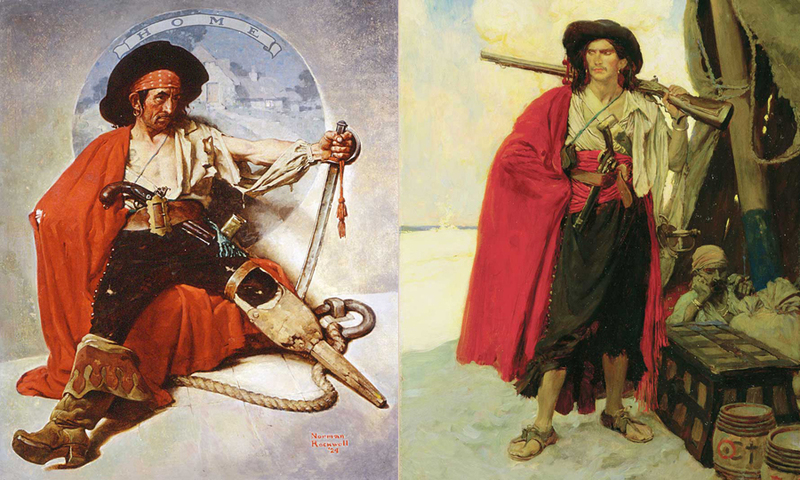 Here are amazing paintings by Cornwell, N.C. Wyeth, Rockwell, and Pyle. 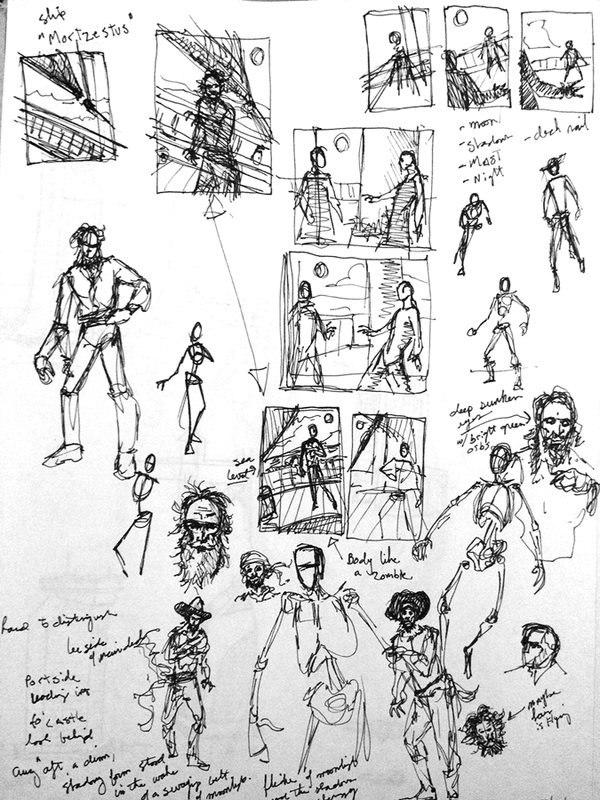 My thumbnails were trying to connect the character with the ship and shadowing/moonlight the passage refers. To almost lose the form in the shadows of the ship, but yet still have it remain tangible that someone could believe it to be a man. 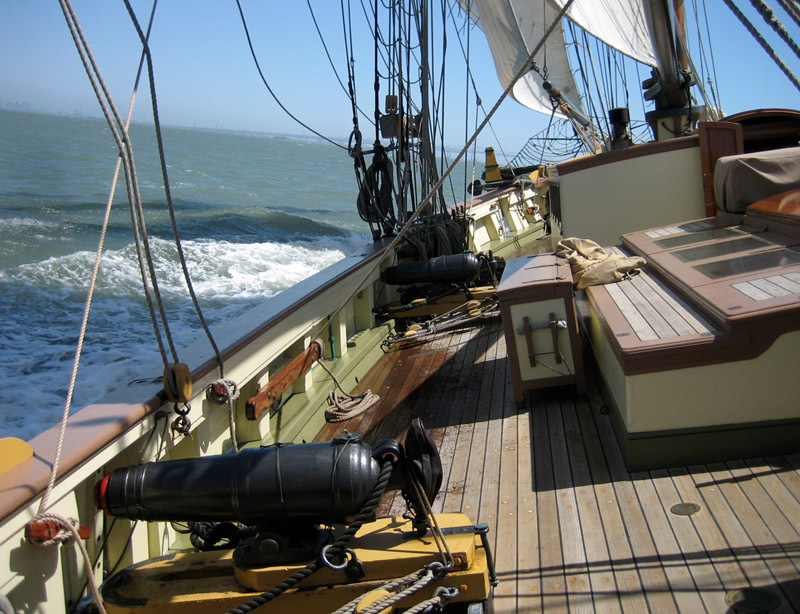 I wanted to feel the sway of the boat and still see the sea behind the figure in the moonlight. 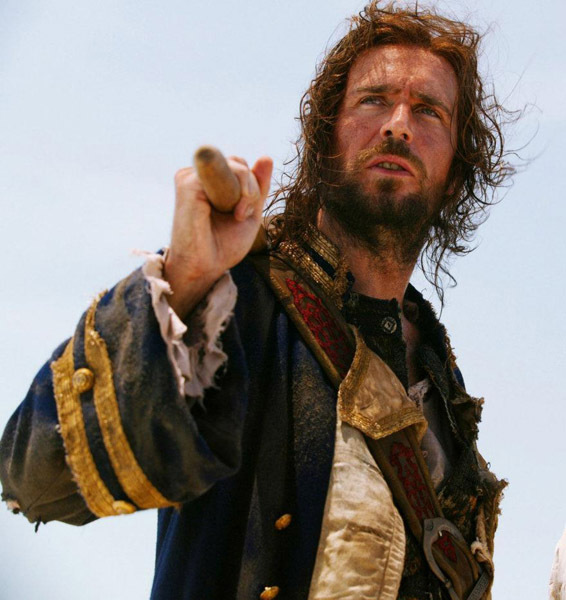 At first I was thinking maybe the pirate would have a weird angle to its body like a zombie, but then thought that the passage didn’t describe anything like that, instead the opposite that the figure just stood there. So I thought maybe a more neutral position. In a later passage the eyes are described to be like glowing orbs so I thought that might be something to play with, almost like cat eyes reflecting light. Well, I’ve been away for awhile. I went back to East Coast to be with my Family for the past month. My mother had knee replacement surgery and I went to help with her recovery. Her surgery went great and it was amazing to be back home for such an extended amount of time. But, now I’m back on the West coast and I’ll tell you it’s not so easy to pick up where you left off. All the momentum I had made was gone. I still have finishing touches on my castle piece. Plus, I have to figure out what will be my next projects. So, planning phase begins. I need to look at the projects I have in mind and figure out which ones of the best to finish first and what is the allotted time I want to take for each. I am in middle of an illustration piece now. I am hoping to wrap it up in the next couple weeks. I’ll be posting progress on this in meantime as I ramp up on new Matte Painting work. Feels great to be picking up the blog again. Leave a comment Been awhile…..